Family Father: Erwin Edwin Nuschke Sr was born on May 2, 1897, in PA. He married Mable Carlson on January 26, 1920. They had three children during their marriage. He died on December 11, 1956, in Coudersport, Potter Co, PA at 59. Mother: Mable Carlson was born on October 20, 1898, in Austin, Potter Co, PA. She died in February 1975 in Austin, Potter Co, PA, at 76. Chico was the adopted home for Edgar Nuschke, a Pennsylvania man whose wife and stepchildren are North Valley natives. While he was never a permanent resident, Chico has become Edgar Nuschke’s final resting place. He is buried in the veterans’ section of the Glen Oaks Cemetery. 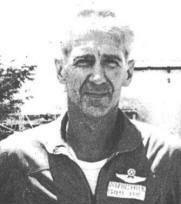 The dilemma was solved in 1951 during the Korean War, when Nuschke was recalled to the Air Force. From that time until he was assigned to Vietnam in early 1966, Nuschke piloted huge Strategic Air Command bombers. In Vietnam, however, he was assigned to be a forward air controller, flying tiny Cessna-like L-19 Birddogs over enemy territory and reporting troop movements and gathering other intelligence information. On Jan. 21, 1967, two months before he was due to come home and retire from the Air Force, Nuschke Was flying another mission. A Navy officer sat next to him, acting as observer. The two men saw somebody run from a building with another person chasing him. They banked and returned for another look. A rifle opened up on them, and Nuschke took a bullet behind the ear and was killed instantly. The plane was not damaged, but the Navy observer did not know how to fly. In a tense situation, he was “talked in” by ground controllers. Nuschke’s step daughter recalled the Navy officer survived that stint in Vietnam, but was later sent back for another tour and died in action. Erwin Nuschke was raised in Austin, Potter Co, PA. In World War II, he joined the Army Air Force, where he received his pilots' training. Alter the war, he decided on a career in optometry. He duly attended school and set up practice in Sacramento. But, said his step daughter, "His heart wasn't in optometry. He liked flying." The dilemma was solved in 1951 during the Korean War, when he was recalled to the Air Force. From that time until he was assigned to Vietnam in early 1966, he piloted huge Strategic Air Command bombers. In Vietnam, however, he was assigned to be a forward air controller, flying tiny Cessna-like L-19 Birddogs over enemy territory and reporting troop movements and gathering other intelligence information. On Jan. 21, 1967, two months before he was due to come home and retire from the Air Force, CPT Nuschke Was flying another mission. A Navy officer sat next to him, acting as observer. The two men saw somebody run from a building with another person chasing him. They banked and returned for another look. A rifle opened up on them, and CPT Nuschke took a bullet behind the ear and was killed instantly.